Put the celeriac pieces into a large saucepan. Cover with cold water, add a little salt, and bring to a boil. Cover, and simmer for 15-20 minutes or until tender. Lift out the celeriac with a slotted spoon, and puree in a food processor or blender until smooth. Stir in the crème fraiche, and season with salt and pepper. Bring the water in the pan back to a boil. Add the potatoes, cover, and simmer for 10-12 minutes or until tender. Remove from the pan with a slotted spoon, rinse under cold running water, and set aside to drain. Add the carrots to the boiling water in the pan, and boil for 8 minutes or until tender. Remove from the pan with the slotted spoon, rinse under cold running water, and set aside to drain. Add the cabbage to the boiling water in the pan, and simmer for 3 minutes or until tender. Drain in a colander, rinse under cold running water, and squeeze to remove as much water as possible. Melt the butter in the pan. Brush a large ovenproof platter with some of the butter, then add the garlic to the butter in the pan and heat for a minute. Toss in the potatoes, and season with salt and pepper. 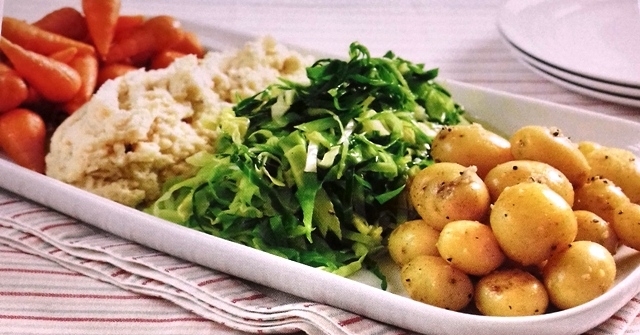 Put the potatoes, cabbage, celeriac puree, and carrots in rows on the platter, and season with salt and pepper. Cover with foil, and refrigerate until needed. To serve, reheat the vegetables on the foil-covered platter in a preheated oven at 220℃ (200℃ fan, Gas 7) for about 25 minutes until hot and steaming. Serve immediately or the cabbage will lose its colour.